Pathway Publishing presently has two main arms — spirituality and the arts. This section mainly features books on the arts — art, photography and poetry created by Jindrich (Henry) Degen, Eva’s father. The books (available both in print and electronic versions at various outlets worldwide, including Amazon and Ingram) include several volumes of Henry Degen’s art, two volumes featuring his digital nature photography, and two volumes featuring his poetry in his native language, Czech. Each book is described in more detail in the following pages, including where it can be previewed and purchased, as well as what readers have said about it. 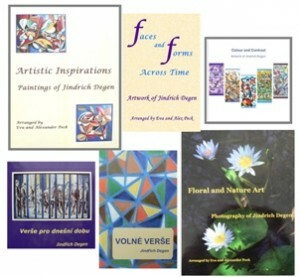 If you are an artist, photographer or poet and are looking for a place to have your books published at a reasonable cost, feel welcome to check our Services. Jindrich (Henry) Degen’s works — art, photography and poetry — can also be seen on his website www.henrydegen.com.